You are here: Home / All Posts / Are You Feeding Your Kids Too Much Food? In our house we don’t count calories (because all calories are not created equal and it’s a lot of unnecessary effort), but we do consider portion sizes when deciding how much to eat at a meal. And who doesn’t like easy? There are so many opinions on what food and how much of that food we should be eating. No matter what you choose to eat, someone somewhere will tell you that you’re doing it all wrong. And they will have a pretty strong opinion about it too. It can get exhausting sifting through the do’s and don’t. Speaking of Do’s and Don’t – you can the Clean Eating Do’s and Don’t here. One thing that I am sure of is that when we are eating incorrectly, our body gives us clues to nudge us in the right direction. All of these are signs that we are doing something wrong. I’m not psychic or anything, but if your family is eating a diet high in processed foods, then I’m gonna guess they are suffering from one or all of these things. So, before you start to sorry about Portion Control (you can come back to this later), let’s just get you started with the FREE 7 Day Real Food Family Challenge and get your family learning some healthy eating habits. This is a really simple (And my personal preferred method) to control portions at any meal. 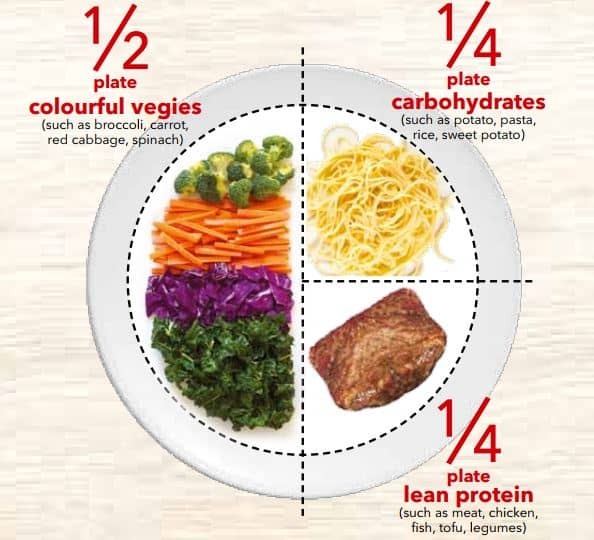 Dividing your plate into portions – and dishing up food to take up the space – you can easily construct a balanced meal every time. This is a a great way to get the family familiar with the concept of how much they should be eating of each food type. If this is a new concept in your home, then consider getting some of these plates. I had them when my children were younger and they still dish up their food like this. Even on regular dinner plates. If you want to be a bit more subtle about it, then take a look at this gorgeous 7 Piece Perfect Portion Control Set. 2. The Hand Hack: The Not Too Exact Science of How Much to Feed your Kids that Works. Using your hand to estimate portion sizes is a great way to keep the amount of food you eat in check. It’s what I call the ‘good enough’ method. Yes, you can weigh your food and count Calories, but I’m just not into that. Sometimes, ‘good enough’ is all you need. The great thing about this Handy Hack (I wasn’t even trying with that pun), is that you take it with you wherever you go and it’s age appropriate. Your hand grows as you grow so your portion sizes grow along with you. Um. Except for the guy I met at the Bank last week. He had insanely small hands for his size. This might not work for him. The rest of us should be all good. Your fist size = veggie portions. Your cupped hand size = complex carbohydrate portions, fruit, dairy (yogurt and milk) and also snack size portion. Your thumb size = fat portions like butter or cheese. I know that this doesn’t look like a lot of food. I know because I feel the same way. Take a look at the image below showing the change in fast food portion sizes from 20 years ago until today. Even I think the portions looked a little small back then. 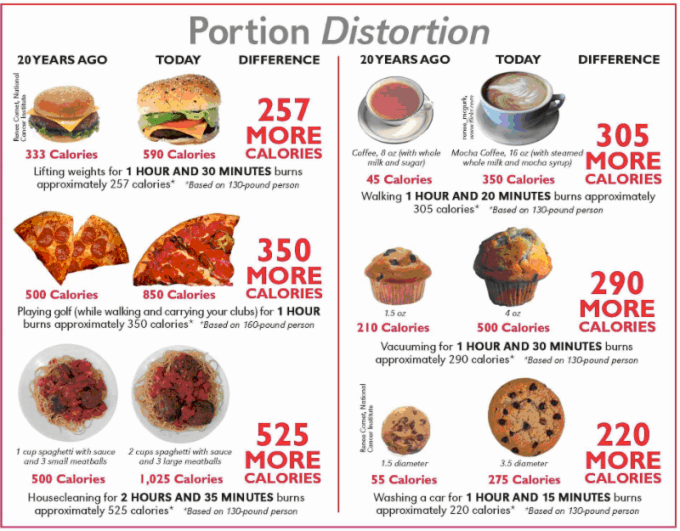 Our brains needs to relearn correct Portion sizes. We have been mislead into thinking that we need to eat a LOT more than we need to. The rates of obesity are souring. And this is the cause: We are simply eating too much! (remember the simple math I spoke about). Thank goodness, we don;t have to leave it all to our dodgy brains. Once you start eating Real Food, a In Built Super Power kicks in to help us. These are called ‘Hunger Cues’. Our bodies are truly amazing biological machines. We all have an inbuilt system which alerts us to when we need food and water – and when we have had enough. These are called Hunger Cues. Food is everywhere—in grocery stores, Television commercials kitchen pantry, fridge, Mom’s handbag – to name just a few. It can be hard to pay attention to your hunger signals with all of this happening around you. Stick to correct portion sizes. Wait a little longer for your next meal. Eating In The Absence Of Hunger Means You Are Likely to be Overeating. Allowing Kids To Get Hungry Helps Cut Down On Picky Eating. Hunger Allows You To Enjoy Your Food. Hunger boosts growth hormone, which aids in regeneration and keeps you looking and feeling young. It also decreases body fat, and because it stimulates cellular regeneration, (Mom’s this one is for you) it helps reduce wrinkles. If you’re eating regularly but are never really hungry by the next meal, then you’re probably eating too much. Try cutting back a bit at mealtimes and stick to correct portion sizes to see how that feels. Wait four to five hours between meals. You want to feel a little hungry but not starving when at the next meal. Stomach rumbling is a good sign. If you’re always hungry, you’re not eating enough, or you’re eating too many nutrient deficient carbs and not enough protein and/or good fat. Try adding more protein to your meals and avoid the empty carbs like bread, pasta, wheat and white flour products. Changing bad eating habits are just as important as introducing good habits when embarking on a healthy lifestyle. Teaching your children to recognize and respond appropriately to their bodies hunger cues is part of process but until this kicks in, you will need to help them by teaching them about portion control.